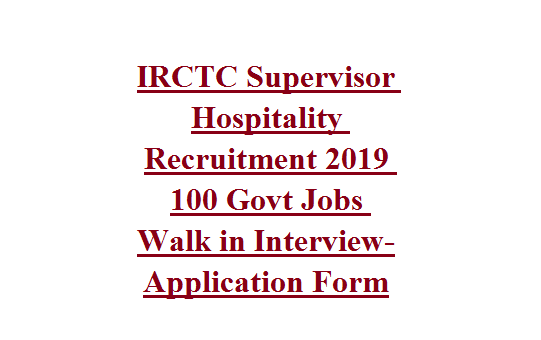 IRCTC Supervisor Hospitality Recruitment-2019: IRCTC Released a new notification for the walk in interview to recruit the available Supervisor (Hospitality) jobs. These vacancies are for the South Zone, Chennai (Kerala, Karnataka, Tamil Nadu), East Zone and North East Zones (Northeast States, West Bengal, and Bihar & Jharkhand State.). Candidates who qualified B.Sc Hospitality & Hotel Administration and having 2 years of work experience they are eligible to attend the walk in interview. Candidates can attend the walk in interview at their nearest IHM as per given dates. Application form is attached with the notification and available for download. 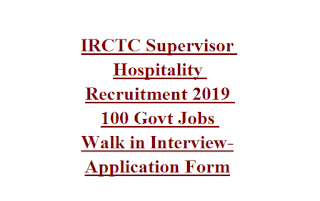 There are total 74 posts are in this IRCTC Supervisor Recruitment 2019. Age limit, salary, application form and other details are given below. INSTITUTE OF’ HOTEL MANAGEMENT CATERING TECHNOLOGY AND APPLIED IIUTRITION Near M.S.Building & SKSJTI Hostel, S.J.Polytechnic Campus, Bengaluru -560 001. All the vacancies are 2 years contract basis. For SC/ST 35 years and for OBC 33 Years. B.Sc Hospitality & Hotel Administration qualified candidates are eligible to apply. Rs.25000/- per month and Daily allowance and other allowances. Candidates selection will be through Interview only. Preference will be given to the candidates who is having relevant work experience. Eligible candidates may attend the walk in interview as per above given dates. Application form is attached below.